The transparent utility bag is made of durable, water-resistant poly vinyl chloride and has an adjustable shoulder strap for easy transporting. 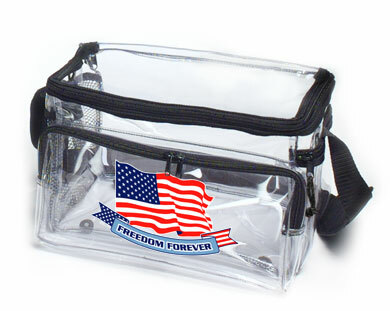 This 8-inch x 12-inch x 7.5-inch utility bag proudly displays the USA flag in the screenprinted "Freedom Forever" logo. The transparent utility bag is made of durable, water-resistant poly vinyl chloride and has an adjustable shoulder strap for easy transporting. 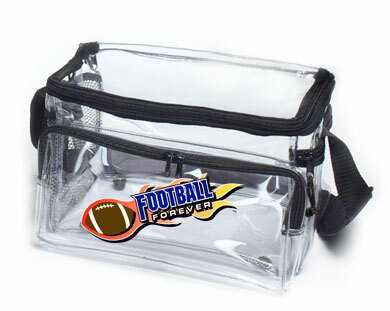 This 8-inch x 12-inch x 7.5-inch utility bag bears the multi-color screenprinted "Football Forever" logo. This fannie pack is made of durable, water-resistant poly vinyl chloride and is equipped with an adjustable waist strap for easy transporting. 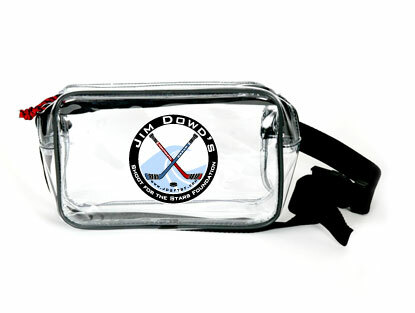 This bag bears the multi-color screenprinted "Jim Dowd's Shoot for the Stars Foundation" logo. All proceeds of revenue go directly to the foundation.